[The] fund’s capital is both leveraged and “hedged.” The leverage arises from the fact that the fund margins itself to the hilt; the hedge is provided by short position – there are always some in the fund’s portfolio. How did Jones’s “hedge” work? In effect, the hedge concept puts Jones in a position to make money on both rising and falling stocks, and also partially shelters him if he misjudges the general trend of the market. He assumes that a prudent investor wants to protect part of his capital from such misjudgements. Most investors would build there defenses around cash reserves or bonds, but Jones protects himself by selling short. Jones’s record in forecasting the direction of the market seems to have been only fair. 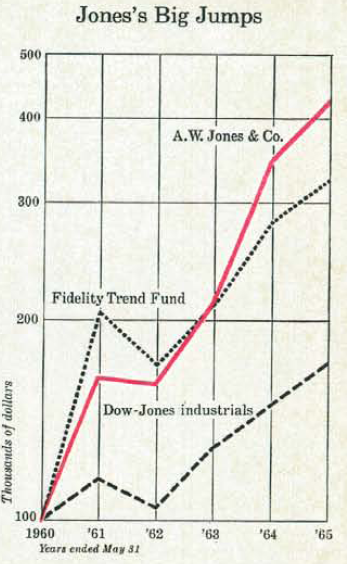 In the early part of 1962 he had his investors in a high risk position of 140 [indicating Jones was unhedged 140% long]. As the market declined, he gradually increased his short position, but not as quickly as he should have. his losses that spring were heavy, and his investors ended up with a small loss for the fiscal year (this is the only losing year in Jones’s history). After the break, furthermore, he turned bearish and so did not at first benefit from the market’s recovery. Last year, as it happens, Jones remain quite bullish through the May-June decline, and then got bearish just about the time the big rally began. As prices rose in August, Jones actually moved to a minus 18 risk – i.e., his short positions exceeded his longs, with the unhedged short position amounting to 18 percent of partnership capital. Despite these miscalculations about the direction of the market, Jones’s selections of individual stocks have generally been brilliant. The idea is common to all the hedge funds, and the idea was not original with Jones. Benjamin Graham, for one, had once run a limited partnership along the same lines. It’s hard to find a place in investment where Ben Graham hasn’t gone first. Thank you Robert for pointing out my article on Karl Karsten. Thanks for the informative stroll down hedge fund memory lane. Is anyone ever going to give us the Karl Karsten story? Didn’t Jones borrow heavily from Karsten’s Scientific forecasting? The reputation of Alfred Winslow Jones is unassailable. As a prophet and seer he rests loftily in the hedge fund holy of holies. Coiner of the theory, then in practice he turned $100,000 in 1949 into many millions in the mid 1960s. So far there has been no need to cast a shadow on his achievement or to doubt his role as the first mover. Every article, every book enjoys a prevailing conceit, a half truth enshrined in myth, that he was responsible for conceiving the idea of hedge funds. However in the background lurks another creator, a writer, academic and investor called Karl Karsten.